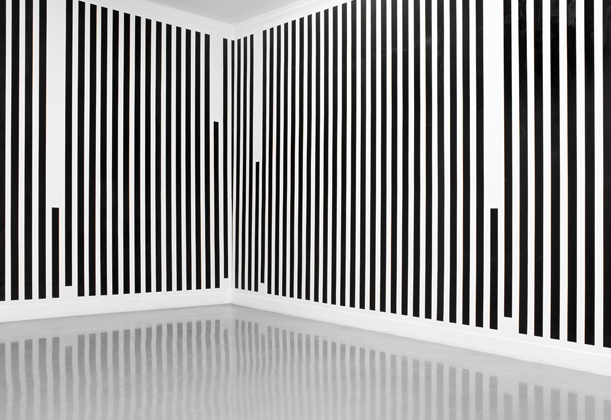 »Untitled (Daniel Buren essay on John Knight’s Leetsoii exhibition)«, 2007. Wallpaper made from a 90° counter-clockwise rotation of Daniel Buren’s essay published on the occasion of the John Knight’s Leetsoii exhibition (Hoshour Gallery, Albuquerque Dec. 1988). Essay republished in: Daniel Buren, Les Écrits, vol. III (Bordeaux: CAPC Musée d’art contemporain de Bordeaux, 1991), p. 309-21. By Yann Sérandour.